Bird Nest Surveys | Biological Services | Keystone Environmental Ltd.
Bird nest surveys are based on the BC Wildlife Act and the federal Migratory Birds Convention Act that provide protection for native bird species, their nests and young from disturbance or harm during breeding season. The purpose of bird nest surveys is to confirm active nests or protected raptor nests are not present in areas where vegetation clearing is proposed. Section 34 of the Wildlife Act prohibits possessing, taking or destroying (i) a bird or its egg, (ii) the nest of an eagle, peregrine falcon, gyrfalcon, osprey, heron or burrowing owl, or (iii) the nest of a bird not mentioned in (ii), when the nest is occupied by a bird or its egg unless authorized under permit. Vegetation clearing is likely to destroy birds’ nests, so it should be done only when the nests are not occupied. To comply with Section 34(iii) of the Act, clearing that must be done during the nesting season must be preceded by bird nest surveys to confirm that active nests will not be affected. A vegetation buffer must be retained around each active nest. Nesting season in Metro Vancouver for most birds occurs between March 1 and August 30, as directed by the BC Ministry of Environment. 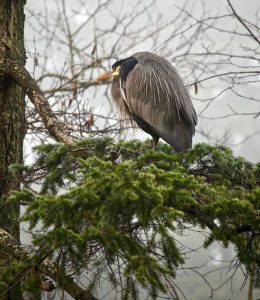 Some birds, such as the Bald Eagle and the Great Blue Heron, have longer nesting seasons that begin as early as January and last until September. If clearing is required to occur within the nesting window, Keystone Environmental’s professional biologists will conduct a bird nest survey and if active nests are present, our biologists identify the appropriate exclusion buffer, so clearing on surrounding areas can proceed without disturbing nests. Our professional biologists have acquired regulatory approvals and worked with First Nations groups to undertake relocation of protected raptor nests, which have enabled projects to proceed while protecting valued habitats.